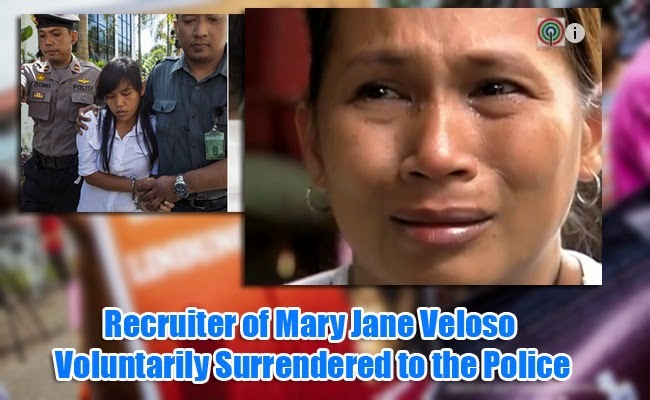 Despite denying at first, Mary Jane Veloso’s recruiter, Maria Kristina Sergio had voluntarily surrendered to the police in Nueva Ecija on April 28, 2015, the same day Veloso is set to be executed. National Bureau of Investigation had already filed charges of human trafficking, estafa, and illegal recruitment, against Sergio and two of her accomplices in connection with Veloso’s case. Sergio, known to others as Mary Christine Gulles Pasadilla, denied the allegation which enraged Veloso’s family, but soon decided to surrender as reported in DZMM radio news. Veloso is set to be executed through a firing squad in Indonesia on April 28, due to alleged drug smuggling of 2.6 kilograms of heroin. However, the 30 year old Filipina insisted of her innocence. Laywer Edre Olalia from National Union of People’s Lawyers (NUPL) shared that it was only moral for Sergio to surrender to the authorities despite it being the last hour. The president of Indonesia can put it into consideration. Olalia added that Sergio can declare that Veloso is innocent. According to Veloso, Sergio learned that she was in dire need of a job. The latter asked Veloso if she wanted to work abroad as a helper. With her two sons now in school, Veloso reluctantly agreed to go with Sergio in Malaysia. Veloso only brought two pairs of clothes, but when they got to Malaysia, Sergio insisted that they should buy more clothes and personal stuff. After buying her needs, Veloso said that she had no bag to put all that they had bought. Sergio then said that her boyfriend, Julius Lacanilao, will be bring her a new bag. A man named Ike and another unnamed man brought the bag to the inn where the two women were staying. Veloso stated that the bag seemed heavier that it should be, but Sergio insisted that it was because it was new. Veloso searched the bag but did not find anything suspicious. Sergio then insisted that before Veloso can work to Malaysia, she must first go to Indonesia and meet Sergio’s friend. Out of desperation for a job and trust to Sergio, Veloso agreed to go to Indonesia alone where she was arrested because packs of heroin had been found stashed at the back of her bag.